Enough already with craft brews and BBQ, not that they are bad, but wouldn’t you like some liquid grapes: a good Cabernet blend, a nice spicy Zinfandel or a bold Syrah. 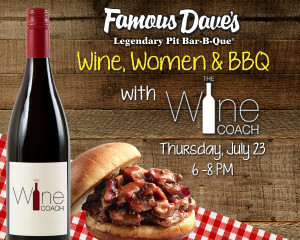 WBAL 1090 AM hostess of the “Sipping Point” Laurie Forster aka The Wine Coach® is pairing up with Famous Daves® in Columbia, Maryland for a very special night of “cue and wine” on Thursday, July 23rd from 6 to 8 pm. Think BBQ is just a guy thing? Well, think again! Grab your BFF, girlfriends and sisters and join Laurie Forster, The Wine Coach®, for this Wine, Women and BBQ tasting. Summer’s favorite foods deserve great wines to match, whether it’s St. Louis Ribs, Pork Brisket, Roast Chicken or a good ol’ fashioned Hamburger hot off the grill. Taste a selection of delicious grilled pairings and get some great ideas to sip on for your next backyard barbecue with family and friends! 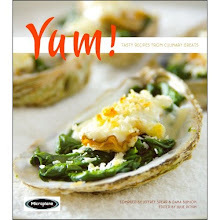 Call The Wine Coach® at 410-820-4212 or visit www.thewinecoach.com/women to make a reservation. Space is limited! 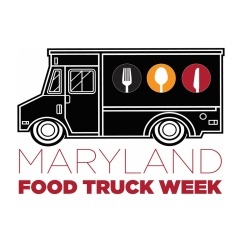 Ladies, for the price of a pedicure sans the tip, $29.99 you can enjoy this all inclusive wine tasting, which includes appetizers, four tasting plates, wine pairings, tax, tip and of course the wine edu-tainment stylings from Laurie Forster. Famous Dave’s began in 1994 when founder, David Anderson, opened his first barbeque shack in Wisconsin. From there, Dave opened two additional locations in the Midwest, expanding Famous Dave’s to become what it is today. Known for their authentic barbecue, Famous Dave’s has been the recipient of over 700 awards, including “Best BBQ” and “Best Ribs” in 2014.